Hopes keep building on a delay of Brexit date until a better solution is presented. EU Chief Negotiator Barnier said that no-deal Brexit preparations are more important than ever. Hopes that the UK will avoid a hard-Brexit kept boosting the Pound this Wednesday, sending the GBP/USD pair up to 1.3081, its highest since early November. The catalyst for Sterling's rally was a new amendment coming from Yvette Cooper, which already gathered support from MPs from different parties, aimed to buy the kingdom some time to prepare an alternative plan if PM May's deal fails to pass the Houses. Meanwhile, the EU is preparing for a no-deal Brexit, according to EU's chief negotiator Barnier, who claimed that is more important than ever. Adding fuel to the fire, BOE's Governor Mark Carney suggested that the central bank may need to raise rates, not cut them, in the event of a no-deal Brexit. There are no macroeconomic data scheduled in the kingdom for this Thursday. The pair retreated modestly from the mentioned high, with broad dollar's weakness adding to the bullish case. 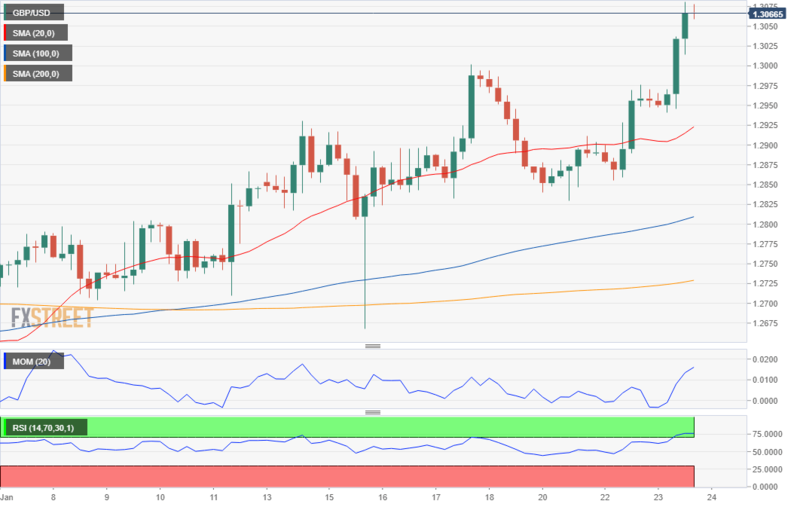 Short-term technical readings support additional gains ahead, given that, in the 4 hours chart, the pair advanced firmly above its moving averages, with the 20 SMA now gaining upward traction around 150 pips below the current level, and the 200 EMA at around 1.2800. Technical indicators in the mentioned chart maintain their upward slopes after entering overbought territory, also indicating that buying interest is strong. Should the positive momentum continue, the pair has scope to advance up to 1.3174, November 2018 monthly high.